Wireless portable speakers have become an essential product category in the audio marketplace. Lots of us want to play our music anywhere and share it with family and friends, and there are many, many companies offering speakers that let us do just that. 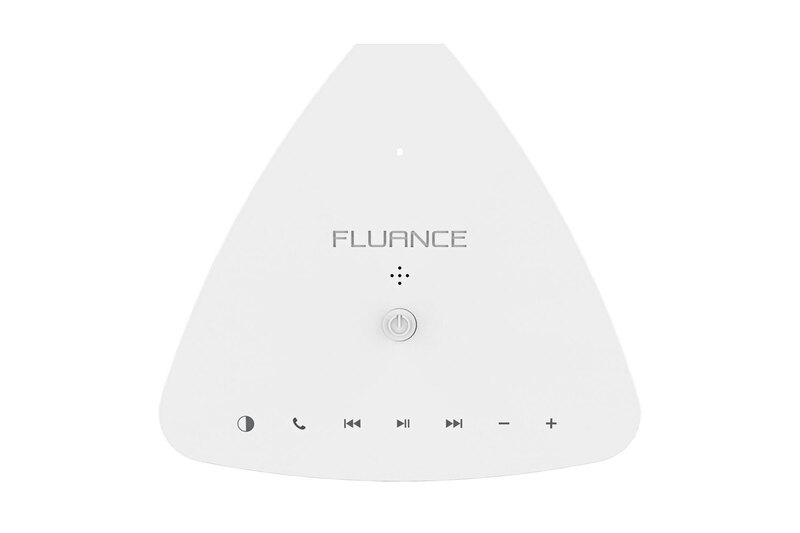 Fluance, a Canadian company that specializes in low-cost, high-performance speakers and turntables, has joined the party with its new Fi20 portable Bluetooth speaker. Its unique design makes a bold visual statement, so I was eager to see if its sound quality measured up. The Fluance Fi20 looks unlike any other portable Bluetooth speaker I’ve seen. 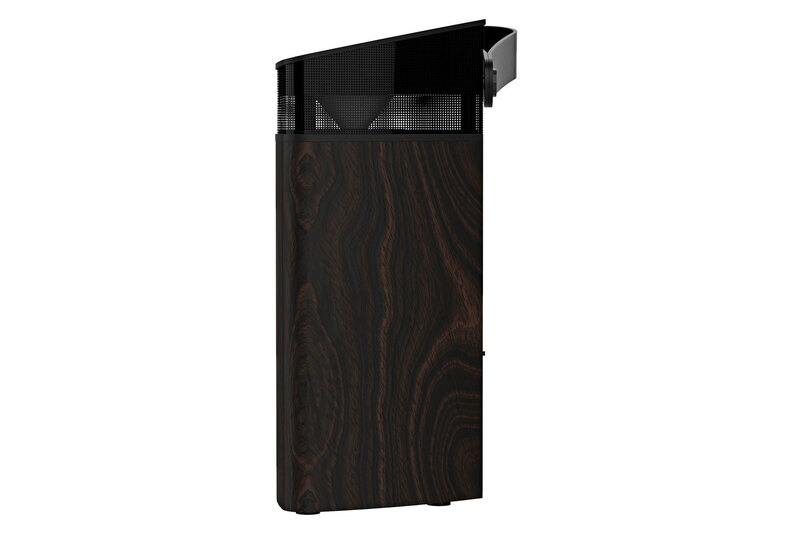 Its triangular cabinet is available in your choice of three wood veneers—black ash, natural walnut, or bamboo—and it stands relatively tall, measuring 12 x 6 x 5.5 inches (HxWxD) and weighing in at three pounds. 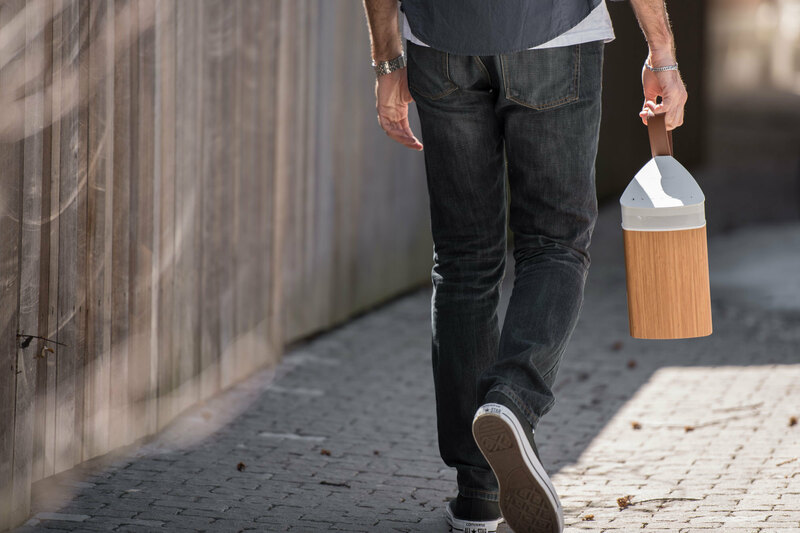 An integrated synthetic-leather handle lets you carry it around with ease. A single 3-inch linen-fiber driver fires straight up into a conical reflector, called an acoustic diffusor, that spreads the sound in a 360-degree omnidirectional pattern through a grille. The acoustically tuned cabinet is ported—a design commonly called “bass reflex”—which, along with built-in DSP (digital signal processing), results in a specified frequency response from 70Hz to 20kHz (no tolerance given). The built-in class-D power amp provides 15 watts of continuous average output. To fulfill its wireless function, the Fi20 supports Bluetooth 4.0 and the aptX profile. (It also includes a 3.5mm aux input.) As a portable speaker, the 11V/2200mAh lithium-ion battery provides up to 24 hours of play time at moderate volume after 3.5 hours of charging. It is not waterproof, so don’t toss it into the pool. Other features include the ability to act as a speakerphone. 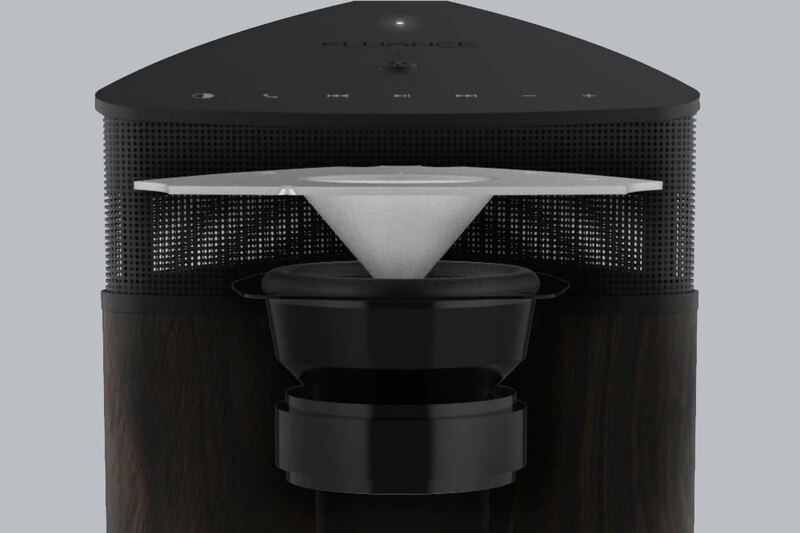 Also, the diffusor above the speaker driver is LED-illuminated, providing a warm-white accent light (3000K according to the specs) when you turn it on. With only one full-range driver, the Fi20 produces a monophonic sound. It can accept a stereo signal via Bluetooth or the aux input, but the left and right channels are mixed into one for playback. Unfortunately, you can’t link two Fi20s to create a stereo pair. All controls and the status indicator are located on the triangular, angled top surface of the Fi20, along with the speakerphone mic. Aside from the power on/off button, all controls are touch-sensitive. The LED status indicator shines with various colors to reveal what’s going on: flashing green when the battery is charging, solid green when the battery is fully charged. After disconnecting the AC power, you can check on the battery status by tapping the power button; the indicator will show solid green (40- to 100-percent charged), yellow (15- to 39-percent charged), or red (0- to 14-percent). It flashes white in Bluetooth pairing mode and remains solid white when Bluetooth pairing is successful or the aux input is connected. The back panel is a slender truncation of one triangular corner of the cabinet. It provides a home for the integrated handle, a Bluetooth reset button, the 3.5mm aux input, and the AC power jack. An AC power adaptor is included, but an aux cable is not. For this review, I listened to music from an iPad via Bluetooth. For the sake of comparison, I played the same selections on the Fluance Fi20 and JBL Xtreme 2, which I recently reviewed for TechHive. The Xtreme 2 has an MSRP that’s twice that of the Fi20 (although street prices shrink the difference considerably), it provides much more amplifier power, and it extends lower into the bass region. Starting with “Once Upon a Love Theme” from Chuck Mangione’s album The Feeling’s Back, the sound of the Fluance Fi20 was quite rich. Mangione’s flugelhorn sounded nice and round, but the bass was somewhat boomy. By contrast, the Xtreme 2 sounded much leaner, with better balance and tighter bass. Next up was “Josefin’s Waltz” from Alasdair Fraser’s album Fire and Grace. This tune includes only fiddle and cello. The fiddle sounded nice and full on the Fi20, but the cello sounded quite bloated. The balance between the two instruments was much better on the Xtreme 2, and the cello was not bloated. Listening to “You’ve Made Me So Very Happy” on Blood, Sweat, and Tears’ eponymous second album, the vocals and horns sounded rich on the Fi20, but again, the low end was boomy with overemphasized electric bass. On the Xtreme 2, the overall sound was lighter, the bass was more balanced with the rest of the instruments and vocal, and the horns were more clearly delineated. I love Yo-Yo Ma and the Silk Road Ensemble, so I listened to “Persian Traditional Avaz-e Dashti” from the album Silk Road Journeys: When Strangers Meet. The various string and wind instruments from Asia and the Middle East sounded very rich. There’s not much deep bass in this track, so the boomy quality I had heard on other tracks was not nearly as pronounced in this case. The Xtreme 2 sounded quite a bit thinner. B-Tribe is another world-music group that, unlike the Silk Road Ensemble, uses synthesizers in addition to ethnic instruments. “Zapateado” from the album Sensual Sensual was a super-bloated mess on the Fi20, though the vocal was surprisingly clear. As expected, the Xtreme 2 was much cleaner and lighter. Moving on to classical music, I played the first movement of Khachaturian’s “Armenian Dances” as performed by the Eastman Wind Ensemble under the direction of Frederick Fennell on the album Grainger: A Lincolnshire Posy. The sound was full and rich, though somewhat tubby in the low end. By contrast, the Xtreme 2 sounded a lot lighter and tighter, with better delineation between the instrumental sections. The same was true with the Love Theme from Tchaikovsky’s “Romeo and Juliet” as performed by the Berlin Philharmonic under Herbert von Karajan on the album Romantic Karajan. The lush strings and thick woodwinds were accompanied by a bloated low end. In this case, the Xtreme 2’s bass was somewhat anemic with a lighter, thinner sound overall. The album Domingo Favourites features tenor Placido Domingo with the Los Angeles Philharmonic under Carlo Maria Giulini. On the aria “Je crois entendre encore” from Bizet’s opera Les Pecheurs de Perles, Domingo’s voice sounded round and full on the Fi20, though as before, the low end was bloated and boomy. On the Xtreme 2, the overall sound was much lighter and better balanced, while the vocal was much thinner. Gilbert and Sullivan’s operetta Iolanthe includes the duet “None Shall Part Us from Each Other,” which is near and dear to my wife and me. The recording I listened to was made by the D’Oyly Carte Opera Company and the New Symphony Orchestra of London under Alan Styler with soloists Mary Sansom and Isidore Godfrey. As with the other selections I listened to, the sound of the Fi20 was rich and full, especially the voices, but the orchestra was bloated in the low end. By contrast, the Xtreme 2 sounded much lighter and better balanced. My first and lasting impression of the Fluance Fi20’s sound quality is twofold: Overall, the sound is rich and full, but the low end is very bloated and boomy. By comparison, the JBL Xtreme 2 sounds much lighter—even thin in some cases—but with better balance between the various frequency ranges. I prefer the Xtreme 2’s more balanced sound, though its list price is exactly twice that of the Fi20. On the other hand, the Xtreme 2 has nothing on the Fi20’s design. 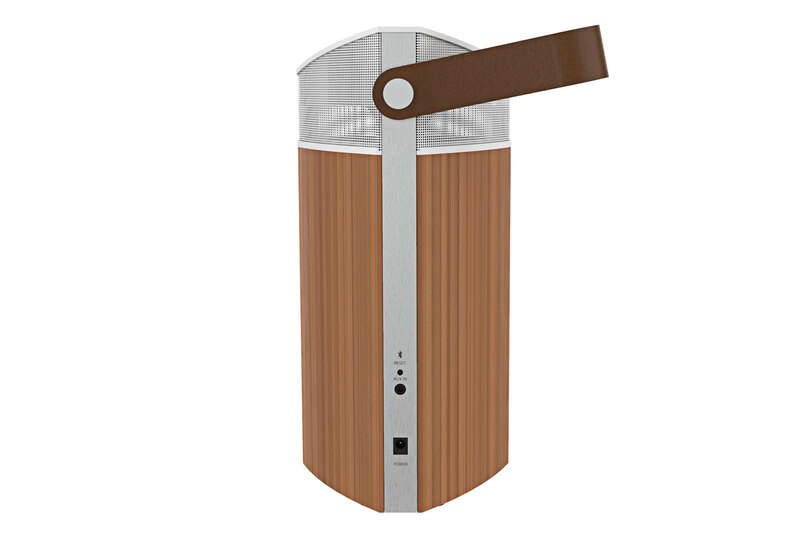 Its unique triangular shape sets it apart from many other products in this category, and its 360-degree omnidirectional sound-radiation pattern is perfect for placing it in the middle of the action. Just don’t place it right up against a wall, as that placement will emphasize the bass even more than the speaker does inherently. Feature-wise, the Fi20 is pretty basic. The only inputs are Bluetooth and a 3.5mm jack, and it can serve as a speakerphone. The battery life is longer than most at up to 24 hours, and it offers an accent light. However, it’s strictly monophonic, and you can’t link two of these to create a stereo pair. Of course, a price of only $150 is very attractive. But along with its unique design, is that enough to warrant a recommendation? Barely. I’m afraid the boomy bass makes me want to look elsewhere. This Bluetooth speaker sports a unique design and long battery life, but its otherwise rich sound is marred by overblown, bloated bass.